The search for Rob Burk’s replacement has ended, and we cannot think of a more worthy successor to Rob’s legacy than Ross Peddicord. A lifelong horseman, Ross grew up on a farm in Howard County, attended the McDonough School where he roomed with Bruce Davidson, rode on the equestrian team and then graduated as a lieutenant from their mounted cavalry unit. He then attended Washington College in Chestertown, where he hunted extensively with Mr. Hubbard’s Kent County Hounds, continued to show and to ride in point-to-points. After graduating from college, Ross’ career galloped through all aspects of the Maryland horse industry. He was a freelance writer for the Maryland Horse magazine (today the Mid-Atlantic Thoroughbred), an ad manager for the Horsemen’s Journal (now defunct), a racehorse trainer, and the assistant director for public relations at the Maryland Jockey Club for the Laurel/Pimlico and Bowie race tracks. But Ross is probably best known for his 18-year career as the award-winning race journalist for The Baltimore Sun. During that time, he and his now-former wife Stephanie established Brush Hill Farm in New Market, where they bred, raised and exhibited Thoroughbreds, including six grand champions at the Maryland State Fair, several Maryland Horse Show Association in-hand champions, and over 30 winners at the track, including stakes winner King’s Corsair, stakes-placed Wm. Withers and Arlington Million Steeplechase winner Shy Donald. Like many who have spent their entire professional careers in the horse industry, he got a little burned out, quit his job, sold the farm, and left the industry for the greener pastures (i.e. greater earning potential) of “the real world.” He went back to school for his MBA at Mount St. Mary’s University, then landed a job as a professional fundraiser, serving as the Mount’s Director of Major Gifts and Planned Giving. While at the Mount, he helped to found the school’s Intercollegiate Horse Show Association riding team and served as its faculty/administrative advisor (and during that time, he directed several outstanding students to The Equiery to serve as interns). 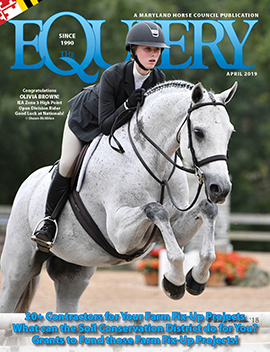 In 2004, Ross and two partners founded Maryland Life magazine, a statewide publication covering the art, history and culture of Maryland, and suddenly Ross was back in the horse industry, as equestrian activities play a central theme in Maryland’s quality of life. During his tenure at the Maryland Life, Ross worked extensively with all 25 tourism agencies (county and state) and currently serves as the chairman of the Maryland Tourism Council, the umbrella organization representing the tourism industry in Annapolis (not unlike the role of the Maryland Horse Council in the horse industry). It was in leaving that Ross paved the way for his return. By leaving the horse industry and venturing out into the “real world,” Ross inadvertently gained the experience and the relationships that will make him an outstanding executive director of the Maryland Horse Industry Board. Rob Burk laid the critical administrative foundation necessary for the daily functioning of the MHIB, and spearheaded the projects (such as the first equine census, the two Horse Industry Forums, and the search for a Maryland Horse Park) that launched our industry into the consciousness of the Governor’s office, the legislators and the general media. With his deep relationships within the Maryland equestrian community, his fundraising savvy, and his broad tourism relationships, Ross Peddicord is poised to take MHIB and the Maryland horse industry to new heights…heights only dreamed about when the equestrian community created the Board little more than a decade ago. PreviousDec. 21: what will Santa give to racing? Did you hear? Racing year-round in Maryland!